From the moment SpaceX launched the Falcon Heavy into space with Elon Musk’s Tesla — with Hot Wheels ’08 Tesla Roadster on the dash — you just knew that Hot Wheels had to find a way to commemorate one of the only known Hot Wheels cars to make it into space. Less than 9 months later. the “Greetings from Space” #’08 Tesla Roadster appears as a #Chase car of sorts in the #2019 Hot Wheels “A” case assortments. The reason why I consider it a #Chase car is that it does appear to be limited. Being that it is an “A” case car, it has only been appearing 1 per case, in about half of the “A” case assortments … and none have shown up in “B” case finds (so far). The Hot Wheels #’08 Tesla Roadster made its debut in the 2008 New Models. Until news broke about the Hot Wheels car being included as part of the actual 1:1 Tesla Roadster being launched into space, it never really garnered much attention from collectors — and thats with it being a #Chase “Earth Day” car, Super #Treasure Hunt, AND being part of the infamous #Speed Machines line previously. Soon after the new broke, prices on the Hot Wheels car soared. 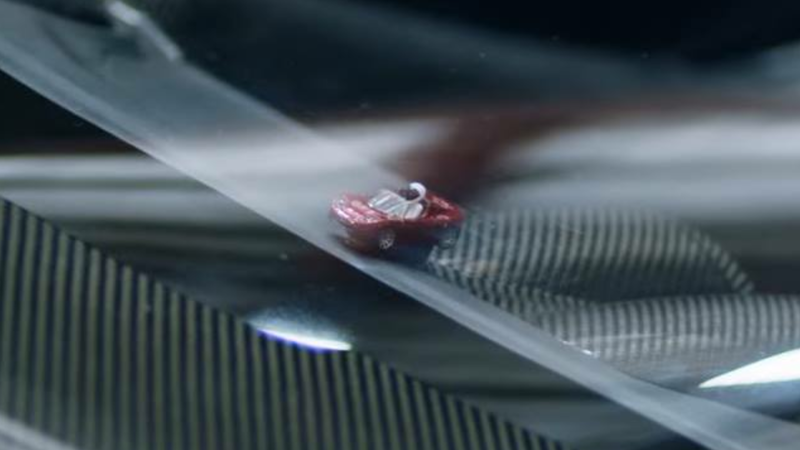 Maybe not to the length of the actual car launched into space, but it sure seemed like there was no limit on how much people were willing to pay for Hot Wheels #’08 Tesla Roasters all-of-a-sudden. Red ’08 Tesla Roadsters from the mainline (2008 New Models & 2016 HW Green Speed) were selling in the $30-range. The Super Treasure Hunt variant of the 2016 HW Green Speed release was selling for north of $60. Even, common basics were in between $10 and $20. It was clear that it wasn’t just Hot Wheels collectors snatching these up. Since then, prices have come back down to Earth *pun intended* but those common ’08 Tesla Roadsters that sat as surplus on secondary sales sites previously, are definitely being bought at a rate that exceeds that of which they were sold over the previous 10 years. As far as this new #2019 Hot Wheels “Greetings from Space” release of the #’08 Tesla Roadster, its paint actually closely mimics that of the 2016 HW Green Speed Super Treasure Hunt variant (shown above) as it is a pretty close match to that of the actual 1:1 car that was launched into space. I was told that the car attached to the dash board of said car, was the 2008 New Models release which was custom painted in dark red, interior painted black and a miniature starman affixed to the interior. The wheels chosen for the 2019 “Greetings from Space” release are the #RA6 Wheels, which have six spokes; resembling Elon’s 1:1 Tesla Roadster that was launched as part of Falcon Heavy, which had a similar style wheel with seven “slanted spokes”. Collectors seem to always love a special edition Hot Wheels car. This one commemorates the first known Hot Wheels car in Space, quite well — short of having a miniature starman in its interior. As mentioned earlier, this one does appear to be more limited than your common mainline car, so it may take a little luck (and some heavy hunting) to find this commemorative release. I was lucky enough to have my friend @tandphwguide supply this one for you guys all to see, so thanks Tim! This may be one of those releases where I need to get another as that card art is pretty cool. As far as the car? Well, I have to say, I am definitely happy to have one loose! RELEASE DETAILS: Metallic Red Body (metal). Clear Windshield. Black Interior. Dark Gray RA6 Wheels. Black Base (plastic). Made in Malaysia. Toy# GFJ71. Released in 2019 as a mainline special edition, not numbered in the 2019 mainline. I like the car but can’t get over the “first car to orbit the sun” on the card. What are every other car orbiting o not the sun? Thank you for the info on this. I happened to find a couple and picked them up because I keep up with what the private space sector is doing. I think It’s really neat!